You remember when it was thought that orchid care was only for the rich and famous. Well that was quite a while ago. 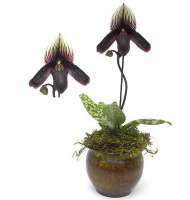 Today most people know that orchids are quite easy to care for and can give you endless enjoyment and pleasure. It is important to know something about the kind of plants that you are growing because the kind of plant determines to a large extent the kind you need to give and that your plants need to receive. Another important aspect of orchid care is the media that the plants or growing in. Perhaps your plants are even mounted on cork bark or on a stick or tree limb. This certainly can change the kind of care that they require. Another fundamental orchid growing tip is to look closely at each of your plants once a week. It doesn't take much time, probably 1 minute per plant. But this is a very important minute. Inspect closely at the leaves including the underside, at the psuedobulbs and at the spike. If you can see any of the roots look at those as well. This time spent on your orchid care will be valuable. Often problems with the roots will show as symptoms with the plant. After a while you will be used to seeing what is normal. Then you will be able to spot any abnormality and be able to diagnose and treat. To make orchid care easy, purchase orchids at a reputable supplier and make sure they look vigorous. Once you bring them home it is wise to separate them from the rest of the collection for a couple of weeks. In case, they do have a disease or insects it is best not to spread it. When you spot a problem act on it quickly. If you are unsure what it is consult your local orchid society or the local nursery for advise on what it is and the best treatment. Care of orchids includes identifying insects like aphids, scale, mealy bugs, spider mites are among the insects that attack orchid plants. To see the latter you will need a magnifying glass. Check with your local nursery or a handbook for the best treatment. Remember these insects have varying life cycles and need to treated so you stop growth at all the cycles. For good healthy growth of your orchids you need the right amount of humidity as well as air circulation. Humidity with out circulation is the perfect set up for fungal and bacterial diseases. The leaves are the first to be affected. There will be soft or sunken spots. 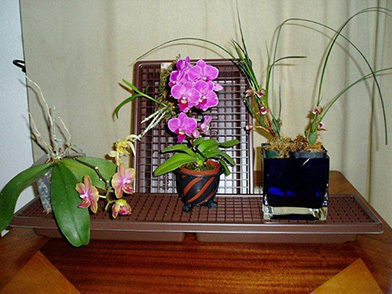 Please see the page on orchid humidity trays for a great tool to handle humidity correctly. The flowers can also be affected. Watchful orchid care will help to spot this, it usually can be a fine speckling on the flowers. They will not last long as well. Orchid growing tips also show that flowers can be affected by virus. You probably will notice some flower speckling, deformed flowers or irregular brown spots on the flowers. If this occurs and you feel this is a viral disease get a orchid professional's opinion. There is not much in the way of treatment. Sometimes professionals will throw out the plant before it infects others in their collection. However this is not always necessary for a home grower. Get Advice. Very recently a home virus testing device has come on the market making it very easy for the home grower to know for sure if a plant is infected with virus. This is an exciting development as up until recently the testing was expensive and required sending material out to a lab. An additional part of becoming proficient in growing orchids and caring for them properly is learning when and how to prune your orchids. The timing of pruning orchids (or if it is done at all) and what it can mean for your plant varies widely depending on the kind of orchid. Don't just decide that they are like your roses and will respond well to being pruned. It is good for some and not good for others. For example the cane type Dendrobiums flower on often leafless canes. If the cane "appears" dead and you cut it off your plant will never re-bloom. So best to get educated before you prune. Another aspect of caring for orchids is the care through the seasons. Depending on where you live, and where your orchids live (inside, outside, in a greenhouse) there may be different orchid tips for the fall orchid season. The fall season is important in many ways. Some orchids need a day and nighttime temperature differential (with Phalaenopsis at least 15 degrees for at least 3 weeks) to help initiate flower spike formation. Equally important is the winter season And of course this must be tailored to the severity of the changes in weather in your location.